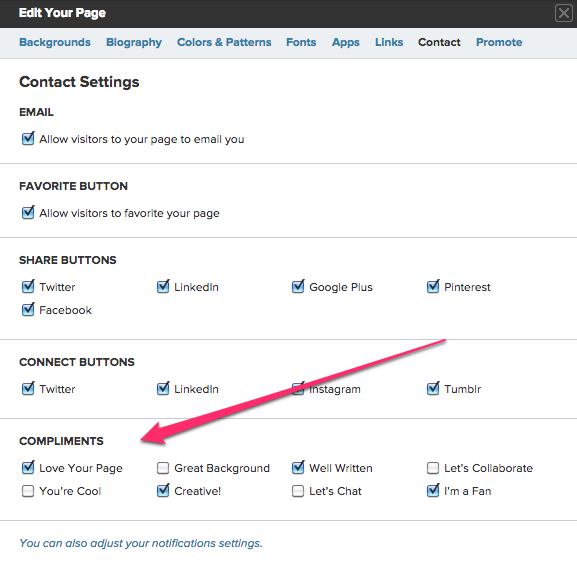 Compliments are a great way to let vistors send a quick note or show their appreciation for your page. Based on the ideas you suggested, we’re happy to offer four new compliments! The newest additions to Compliments are: You’re Cool, Let’s Chat, I’m a Fan and Creative! You control which compliments display on your page. Just head to your Contact tab in the Edit panel to add or remove any compliments you’d like. So stop by your favorite pages and let them know why their pages rock with some compliments. My only problem is, how do you “respond” to getting one of these “Compliments” that seemed confusing to me. You can either reply to the email notification telling you of it, or head to your dashboard, where you can reply Thanks! Or visit their page.